Streamlined design compared to original 505. Easy to use analog controls. 9 new Zoom effects. July 21, 2000 announced at NAMM. Popular, inexpensive multi-effect guitar pedal. New distortion effects include Clean, Scream, Wild and Shred. New modulation effects such as Cry, Tremolo, Ring Modulation, Slow Attack and Echo. 33 guitar effects, arranged in 7 modules. Use 9 effects at the same time. 12 types of distortion sounds. 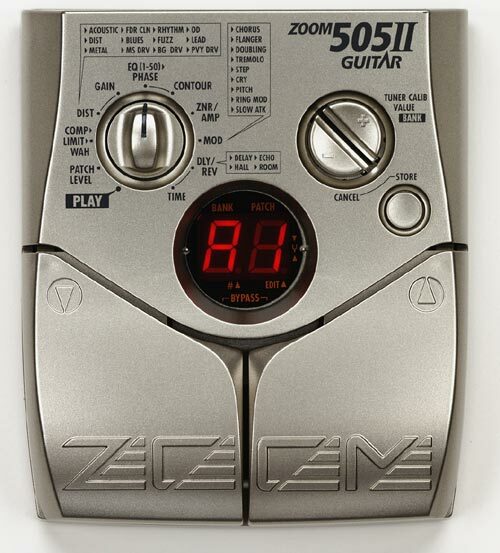 Famous guitar amp sounds created using Zoom’s proprietary VAMS (Variable Architecture Modeling System) technology. Large rotary selector, easy-to-read red LED display and foot switches. 28 hours of continuous operation with four size AA alkaline batteries plus AC operation.